Cook Islands food makes the most of the fresh tropical ingredients that are so abundant on its Pacific islands. Seafood is a large part of the diet and is cooked in a variety of ways, however the most common method is known as an umu or earth oven. The Umu cooking method involves burying the food in a shallow pit in the ground that is then wrapped in banana leaves, covered with volcanic rock and steamed under layers of leaves and sand. The process takes about three hours to complete, and is definitely worth the wait! Key ingredients in most Cook Island diets include coconut, papaya, breadfruit, cassava and taro, all of which are grown all over the islands. Cook Islands food is simple but fresh and packed full of flavour. A home brewed alcoholic beverage is enjoyed by the men when they gather at the tumunu (a type of bush pub) and is made from sugar, oranges, yeast and malt. Banana: Not only is the fruit used, but so too are the leaves, particularly to wrap other things to be cooked in. The fruit of the banana is eaten ripe as well as green. Breadfruit: A starchy fruit that gets its name from its bread-like texture, its sweet taste doesn't stop it from being baked, boiled, barbequed, fried and roasted like a vegetable. Cassava: A starchy plant, only the root is used and is most often boiled and served as a side, similar to rice. Coconut: Fresh coconut milk as well as the grated flesh of the coconut are used widely in Cook Islands food for both sweet and savory dishes. The first extract from the coconut is most commonly known as coconut cream, while the second extract is the thinner coconut milk. Coconut Heart (Heart of Palm): Available both fresh and tinned, coconut hearts are found in the inner core of some breeds of palm trees. Coriander Roots: The roots of this popular herb offers far more intense flavour than the leaves and is often used in curry pastes and soups. Papaya: A popular Cook Islands fruit, Papaya is used both ripe and green most commonly in salads. Seafood: The Cook Islands uses a wide range of fresh seafood caught off its shores including fish, crab and lobster. Smoked Sea Salt: Available from fine food stores, this version of sea salt crystals have had a smoky flavour added to enhance dishes. Soubise: Similar to a béchamel sauce, this white sauce also includes the use of onion for more flavour. Surf Clams: Slightly larger than normal clams, this medium-sized seafood can be caught fresh or are available from good fishmongers. Taro: A tuberous vegetable used often in Cook Islands food, it is usually served as a side to other dishes. Udon Noodles: Although most associated with Japanese cuisine, this thick wheat noodles are also popular in a number of Cook Island dishes. 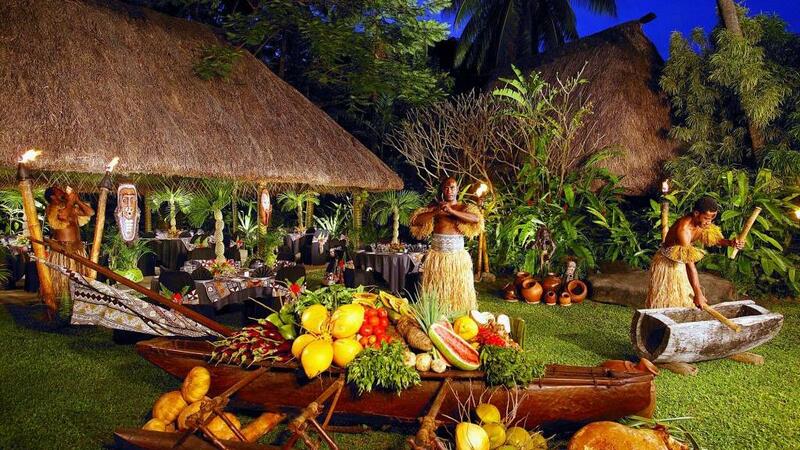 To sample some of the traditional Cook Islands cuisine, attend the overwater night show and dinner.